There’s an entire world off of this campus (believe me, I’m a local.) This week’s off-campus excursion took me to Indraloka Animal Sanctuary’s Annual ThanksLiving Event. Yes, ThanksLiving, not to be confused with Thanksgiving. ThankLiving is a heart-warming day at the sanctuary, where the resident turkeys are honored and celebrated. 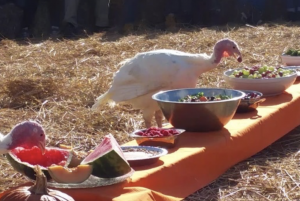 These turkeys were paraded to their own table where they enjoyed a meal of spinach salad, fruit, seeds, watermelon and pumpkins. Indraloka’s ThanksLiving event showcases a more compassionate take on the typical Thanksgiving meal. ThanksLiving was hosted by Olympians Rebecca Soni and Malachi David, news anchor, Paola Giangiacomo, WBRE Eyewitness News Anchor, Mark Hiller and author, Eric Lindstrom. This year’s event had a special twist, as it was held on Indraloka’s new and more accessible property in Dalton. This property will help Indraloka continue to compassion for animals and humans alike. The main sanctuary barn will have classrooms for children, yoga studios, music rooms, art rooms and more.